Well, I am now the proud winner of a 1964 Vespa Super with side car. As time starting running out on the auction, I contacted the next highest bidder and told him what my high bid happened to be. I told him all he had to do was bid one dollar more than myself and the bike would be his. I was not going to go any further. I learned later that he thought that I was the seller trying to drive the bids higher. Nope. I can assure him that I am not the seller. It appears that now I am the buyer. Can't say that I'm unhappy about it. It certainly isn't something I really set out to do. It has just kind of happened. So, why didn't I just refuse to honor the bid? 1. You can't just refuse to honor a bid without giving a really good reason for doing so. eBay has strict rules for retracting a bid. Trying to discover the reserve price isn't one of them! 2. Deep down inside, I really like the bike. Especially after all the fuel I just put into my Suburban today! It will be nice to just let that thing rest in the carport until the whole family needs to go somewhere together. Right now I would describe my mood as "in shock." Hope this tank lasts a LONG time! I almost hesitate to publish this post. I am watching the devastation in New Orleans. It makes any inconvenience here seem woefully insignificant. I started the Suburban this morning to take the kids to school. I noticed it was slow to start and realized that the fuel tank was low. I decided to go ahead and fuel up before I gave the truck to my wife later in the day. 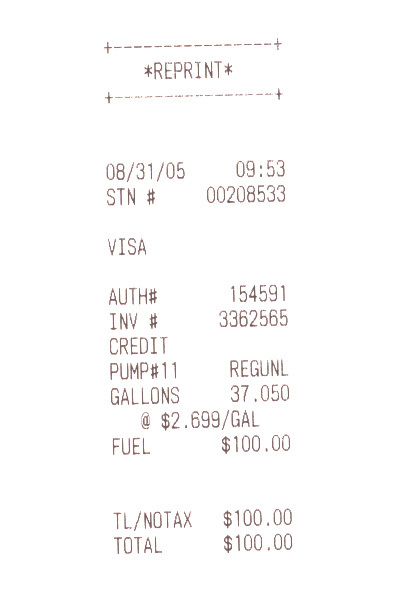 The fuel was 2.699 a gallon. On a lark, I thought, "I think I will fill it up and see how much it cost." I didn't even look at the pump as I kept holding the handle. Then I heard the pump stop. I turned around and saw that the pump had stopped at $100. I probably could have put in five more dollars. Tonight as my family headed to church, every gas station had lines to get fuel. On the way home from church, many of those stations appeared to be running out of fuel. One station was completely closed. Little did I know that this was going to happen when I was there fueling this morning. Now, I'm glad I did! Only one day left on the Vespa auction. I'm actually starting to hope I win the thing. I've got a lot of emotion invested in it right now! I also decided to go back and contact some of the people who have already purchased Vespas from my Indonesian connection. I was very pleased with the reponse I have gotten from them. They have nothing but good things to say about Bram (short for Abraham) the guy who owns the company and restores these bikes. Not only did they say that Bram was honest in his transactions and communication, they also said that the bikes live up to the descriptions on the Web. I'm feeling a lot better on that front... but Jakarta, Indonesia! That is a long way away. It is going to cost something to ship that thing over here. Of course, what a story to tell. I just hope that there isn't a chicken in the package with a case of bird flu! This could all just a thing in the past tomorrow. Surely someone will out bid me. Most of the other Vespas are going for more than I have bid. Oh boy, I'm still the highest bidder on the Vespa. Of course, right now the Vespa is starting to look better and better. The way fuel prices are starting to climb the 90 miles a gallon those things get is starting to warm me up to the little two wheeler. Really it wouldn't bother me so much except I wonder if I am getting a piece of garbage that looks good on the Internet but will fall apart when it gets here. Today I did something kind of stupid... I think. When I was over in France one of the things I thought was really cool was all of the Piaggios over there. Of course, they were the new variety and not much like the "mopeds" we have here in the states. Upon returning home I went by my local Vespa dealer to check them out. Nice. Expensive. Still, the new ones just didn't have the mystique of those older ones you see in some of the old movies. I decided against buying one. Still, I couldn't get it out of my mind. Ebay. I decided to just look at what might be out there. I found it alright. It is a beautiful 1964 Vespa Super. It is a 150cc scooter with - of all things - a side car. I don't know if I want to buy it. There is a reserve. I kept bidding to see what the reserve happens to be. I finally beat it. Now I am hoping that someone else will come along a out bid me! It is a nice bike but it is in Indonesia! It appears that my mailer is sending the post so that the Blogger parsing engine is encoding the HTML tags in readable characters. Hmmmm, have to get it to stop doing that. I guess the mailer is encoding the message as plain text. I need it to encode as HTML. Well, I guess that test didn't work! I am trying to arrange it so that I can use a form email to send a blog post. It looks like I need to make sure it gets sent in the correct format.